The Nokia C2-00 audio output isn't by any means spectacular, but it's probably more than you can expect, given the price tag. The phones does pretty well when connected to an external amplifier (such as your home or car stereo) and it's among the loudest devices we have seen. 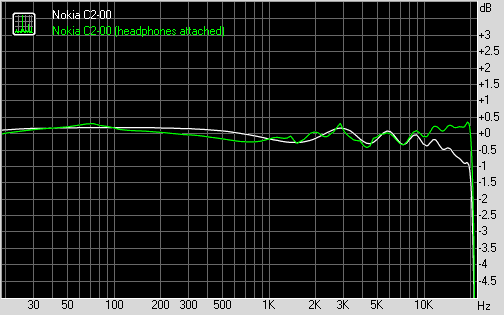 When you plug in a pair of headphones there's notable increase in intermodulation distrotion and stereo crosstalk, while the volume levels drop rapidly. However, you are still left with a decent output so in general we can say we are pretty pleased with the C2-00. The Nokia C2-00 comes with a fixed-focus VGA camera that takes photos with maximum resolution of 640x480. There are options for white balance, several effects and a self timer. There's little point in talking about image quality, besides saying it's awful. The lens has great issues with corner softness, barely leaving the center of the photo with some scrap of sharpness. Anyway, here are a few camera samples to give you an idea of what we're dealing with. The video camera is limited to QCIF@10fps, which makes them usable for MMS only and practically nothing else. Here’s a video sample. Nokia have always been on top of things in the organizer department. The Calendar is the full-featured app we should all be familiar with by now. It has month, week, and day modes and five types of events to set up. The Nokia C2-00 calculator offers two versions - basic and advanced. In addition, a loan calculator is also available. The consistently useful unit converter tops the list of additional applications. The Nokia C2-00 also includes a Dictionary app (our unit had an English-Chinese dictionary). The Expense Manager is potentially very useful: it allows you to keep a list of expenses (including recurring monthly expenses) in various currencies and it has various viewing modes (daily, monthly, budget and category). The main virtue of the Nokia C2-00 is undoubtedly its rock bottom price. And we mean mobile phones in general, not just dual-SIMs. For the little cash you spend, the C2-00 tries to offer all-round features and does it with varying success. The camera for one is barely a step up from not having a camera at all and we were disappointed by the lack of quad-band connectivity (not to mention 3G). Still, with support for huge microSD cards and a powerful loudspeaker, the Nokia C2-00 can save you some cash by taking the place of a basic MP3 player. The phone offers the traditionally feature-rich Series 40 experience, though it carries its flaws too – such as the lack of smart dialing, an office document viewer or some UI animations, for that matter. But since we're getting the same treatment as on pricier S40 models, we're not going to hold that one against the C2-00. The ultimate question though is, what else you can get that fits the "cheap, dual-SIM, dual-standby" bill. Well, the Nokia X1-01 is about as low as you can go - it drops the arguably useful VGA camera and it's a S30 phone, so no Java apps. However, it may be even better value for money than the C2-00. You can also wait for the much fancier Nokia C2-06/C2-03. With a 2.6" QVGA touchscreen, it's closer to mid-range feature phones than the C2-00. It doesn’t have Wi-Fi though (unlike some of the other touch-enabled S40 handsets), which would have been a major perk. Then comes a handful of Samsung offerings. The Samsung E2152 adds Twitter and Facebook integration to the C2-00 recipe, plus a flashlight. The Samsung Ch@t 222 builds on that with a QWERTY keyboard, while the Samsung E2652 Champ Duos goes full touch (and there's the Wi-Fi enabled E2652W version too). A slightly higher-end offering, the Samsung C6112 is a slider with 2.4" QVGA screen, 2MP camera and DNSe. This is by no means the full list - go to our Advanced search tool and look up "dual sim", You can set other preferences to narrow down the alternatives that are most suitable to you. Mobile phones are a necessity in today's world - being always reachable, being able to reach others all the time is no luxury anymore. It's with phones like the C2-00 that Nokia does so well on emerging markets. The Finns obviously know how to cater to small budgets. 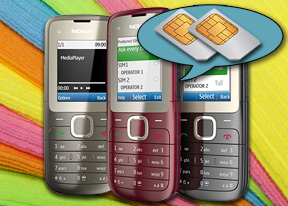 Going dual-SIM gives greater flexibility and allows users to cut phone bills to the bare minimum. While the C2-00 isn't the only phone to do that, it's a well-executed version. It's worth considering even if you just wanted a cheap, basic phone. That second SIM can always come in handy later.